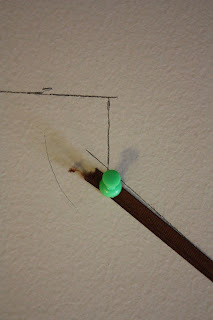 And then we lived with our walls like this for months. Drove me absolutely crazy every single time I walked upstairs. Finally this past week I decided to do something about it. 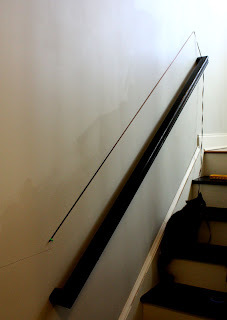 As a temporary solution until we get around to putting in paneling, I decided to use a quart of the bottom color we had gotten correctly color-matched the night we got our refund to paint a straight line going up the stairs. We would still have two colors, but at least they would look somewhat neat and intentional. 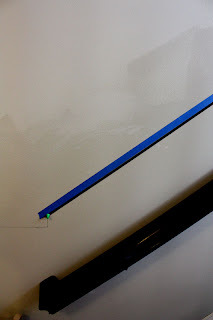 I thought that I could simply measure a specified distance up from the baseboard at intervals along the wall and then use a straight edge to connect the dots. Wrong. I ended up with one very crooked line. 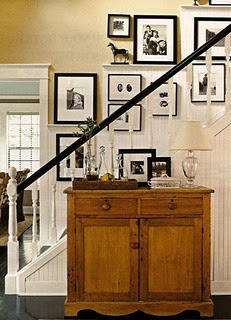 Plan B: Use thumb-tacks and a spool of ribbon to create a straight line up the stairs and use it as a guideline to tape. 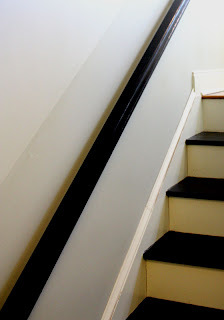 What shades of gray are you using and brand of paint? 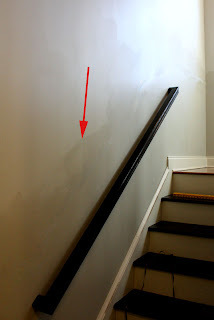 We are looking at painting our walls gray but have not had much success. 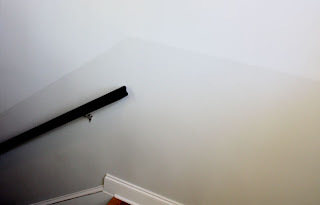 When we have painted them gray it turns a shade of blue thanks to our lath and plaster walls. I am trying to find one that my husband and I can both agree on. Jenn, both colors were supposed to be "Oatlands subtle taupe" by valspar. I think the darker color is closer to the paint chip. Good luck picking a color - gray is tricky! I think it actually looks pretty neat for a simple solution from a pretty bad outcome. 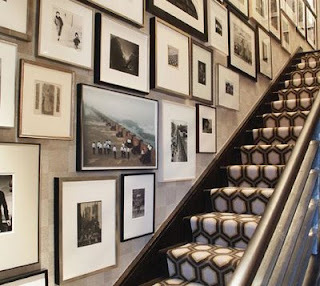 I love the art work idea....tons and tons of black and white photos is so elegant!